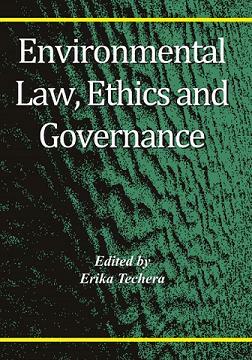 New to book stands is a book edited by Erika Techera from Macquarie University titled Environmental Law, Ethics & Governance. The adoption of the concept and theory of sustainability by domestic law has not garnered an environmental ethic nor resulted in meaningful changes to legal, political, cultural and community institutions. As a consequence, the law remains incapable of attaining environmental improvements for the benefit of humans and other species. Present day environmental law is still primarily concerned with protecting property interests and upholding a narrow view of responsible government. Further, the law still characterises and purports to protect the environment as divisible components. This chapter argues that introducing a broad and multi-faceted theory of environmental justice drawn from environmental philosophy into the law would redress the environmental ethical deficit in the law. In particular, the chapter shows how an environmentally just legal system would be reformed with a focus on environmental assessment, pollution control, and species preservation laws. What’s an encumbrance? Environmental justice? Emission standards? Arising from the United States in the 1980s, the environmental justice movement argued against environmental discrimination: principally the siting of environmentally harmful industry in poorer, black and immigrant communities. The movement articulated a principle of environment justice: that people should have equal access to environmental goods (like parks and clean water) and share the burden of environmental bads (like landfills and polluting activities). This principle of environmental justice has since been broadened, and for the purpose of the law now encompasses rights of participation and access to justice in environmental decisions and public interest environmental justice now also extends to theories of ecological justice, which consider non-human parts of the environmental court proceedings. The principle of environment as having rights that should be protected for the environment’s sake and not just because of human interest and utility in the environment.